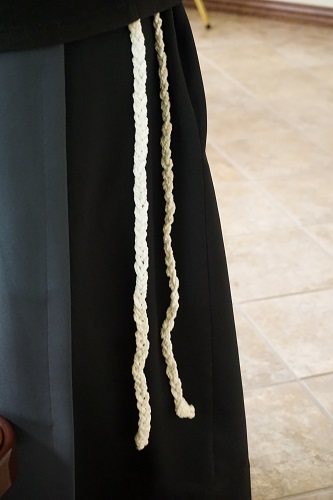 Our Lord said to Mother John Marie, “I will have you remove the garments of this world, and clothe you in the garments of repentance.” The black habit is our renunciation of the garments of this world, and black is a sign of penance. Mouse over and click on the sister's habit to see the meaning behind it's different parts. The black habit is our renunciation of the garments of this world, and black is a sign of penance. The gray color is also a sign of penance as in putting on sackcloth and ashes. The scapular represents our yoke of obedience. We unite our will with God through obedience to our Superiors. In modesty and humility, we cover our hair, which is a woman’s glory. A head covering is also a sign of submission in obedience to God’s authority. The veil changes from white during novitiate, to gray after first profession, and a blue band is added at perpetual profession. The crucifix around our neck reminds us of what Jesus did for us, the cross we carry is what we do for Him- joining our prayers, works, joys and sufferings with His, trusting that our crosses will in turn lead to victory with Christ. We remember Jesus’ death on the Cross for us, which brought our salvation. Received upon final profession. The insignia reads, “Jesus is Lord.” with the symbol of a crown on top of a cross. It is our desire for Jesus to be crowned as Lord of Our Life. 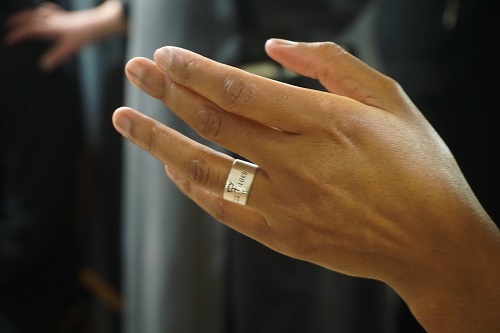 The ring is the symbol of our spiritual marriage covenant to Jesus for the rest of our life. 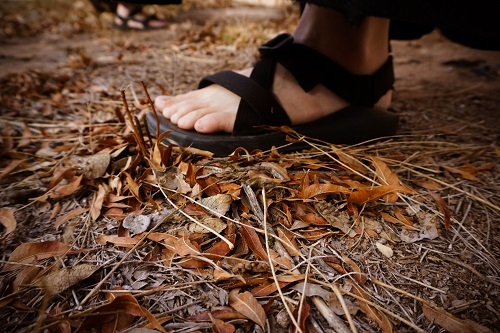 In our simplicity and Franciscan tradition, sandals are usually worn.